Phillies general manager Matt Klentak was hesitant on Monday to even remotely criticize manager Gabe Kapler and his first-year performance, but team president Andy MacPhail was a little more forthcoming as he met with media on Tuesday. The knock on Kap? The rah-rah gushy commentary, especially when things are going off the rails, needs to be curtailed. "I watched this happen to Dusty Baker," MacPhail said. "If you are overly positive, then you lose credibility with the fans after a while. You have to find a way to craft a message that's not critical of your players or negative, but acknowledges that there are some areas — like the rest of us — we need to make some improvements." 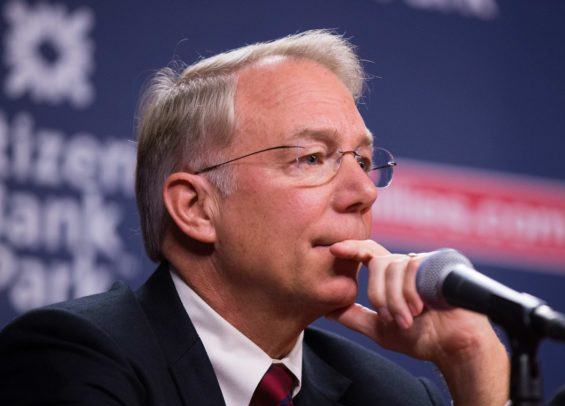 As for personnel on the field, MacPhail gave an honest assessment and admitted he was angered by the sloppy play that plagued the Phillies throughout much of the season. "It's one of the things that is going to confront this organization this off-season," said MacPhail. "The defense wasn't what it needs to be and we have to do a better job in our division, but we are the most inconsistent team I have ever been associated with." MacPhail contends ownership is comfortable with increasing payroll, but the decision has to be fruitful for next year and beyond. Chasing a free agent just because the club has the financial resources to do so doesn't make sense. "If you were going to invest all you had on one star-type player, then that would be sort of an acknowledgment that you think you may be one player away," MacPhail said. "There's always going to be that push for, 'Sign this guy, sign that guy.' Is that really going to solve the problems that I articulated earlier -- the defense, playing within our division better, being more consistent, striking out less? I mean, those are all things we're going to have to balance this offseason. "We have flexibility," MacPhail added. "At the same time, it's not so overwhelming that we don't have to manage it. I anticipate we're always going to be active. This ownership group has demonstrated it's not afraid to have a payroll in the top five." Bryce Harper and Manny Machado are at the top of the list of potential targets and both will command top dollar, but MacPhail did suggest he and the Phillies brass are also looking at the next two free agent classes. It'll be interesting over the coming weeks to see what management does. Reading between MacPhail's comments, it appears the organization will only make a hard run at someone like Harper or Machado if brass believes the rest of the surrounding talent on the roster is contender ready. That's a major question mark that this past season left as inconclusive.